Here’s my honest review and story about my experience with Quick Straight Teeth invisible braces system. I had braces in high school which in my head was 10 years ago but in reality I need to add 10 more to that number. I had these perfectly straight teeth and I was given a retainer to wear but in all honesty, I have absolutely no idea where that thing is now. I vaguely remember finding it in my early 20’s and I tried to put it in and it hurt which probably shows my teeth had already started moving back. Jump forward 10 years on, what I didn’t like was that my upper front teeth appeared skewed to one side & one of my front teeth overlapped the one next to it a little. Overtime this got worse & I was noticing that when my lips were closed together I could see that tooth starting to stick out. Further to this I read that as you get older, your teeth move a little more so I was very worried that it was going to get worse. Then three people I knew got Invisalign at the same time! I had toyed with this idea but the cost was much closer to $10k than $5k and the length of time seemed to be 12 – 24 months as a standard. 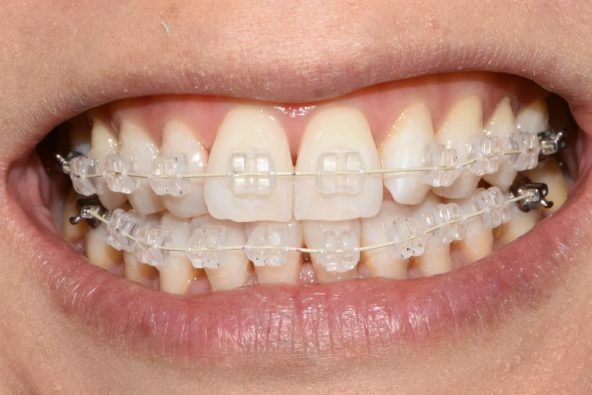 I didn’t even bother looking into braces as I recalled the metal mouth look from my high school days and was not at all keen for the length of time the traditional braces would take. So I basically shelved the idea and resigned myself to crooked teeth for the rest of my life. Enter Oracle Dental and Quick Straight Teeth! When Melanie explained the concept to me, I jumped at the chance to be one of her first patients to experience this treatment. She pretty much had me at “6 months” but I like details and Melanie was great and also very patient as she explained the whole process and answered all of my questions. I booked in for an initial consultation which consisted of having some moulds and photos taken. It didn’t take long at all – maybe 30 minutes. I was contacted a few days later by Oracle Dental to tell me that I was a suitable candidate for Quick Straight Teeth (hooray!) and I booked an appointment to get my braces on. I learned that not everyone is suitable because the system is a cosmetic orthodontic treatment and isn’t able to treat all conditions. This is why it can be done by Melanie as a dentist rather than needing to go to a specialist orthodontist, it’s also why the cost is so reasonable. The cost is $2,000 per arch (see how I’ve picked up some dental terms since I’ve been visiting the surgery lately?) which includes everything, even a bonus whitening kit at the end. I was really happy with the cost, the time I was going to have to commit to having the braces on, the number of appointments and the whitening. 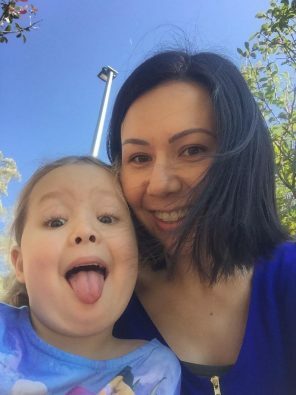 Between finding out I was suitable and the day of the appointment I had some mixed emotions. I was excited by the thought that my teeth would finally be getting fixed but I was also a little freaked out about getting braces……………as an adult! My fears were mostly about the look of the braces and how much it might hurt. I remember the sore mouth, ulcers & trouble eating after going to the orthodontist as a kid. I woke up on “braces day” and felt a mixture of nervousness and excitement. When I got to Oracle Dental, Janine at the front desk jokingly told me that the braces weren’t clear but were actually fluoro coloured and I did that nervous laugh where I really wasn’t 100% sure she was joking. When I got into the chair, Melanie prepared my teeth and then applied the braces by putting a mouthguard type thing into my mouth and pressing it against my teeth. The braces were actually inside this mouthguard (obviously not the correct dental term) and when she removed the mouthguard the braces were all on my teeth perfectly. It was quite amazing and super-fast, certainly not the painstaking process that I recall as a teenager. Melanie then inserted a wire through the braces and put bands around the wire to hold it in place. The bands did feel firm as she put them on but it wasn’t uncomfortable. Once the top and bottom arch were done, she checked my bite and explained that she needed to place some temporary material on my top back teeth to prevent the upper teeth hitting on the lower braces. That part was also painless and quick. The only uncomfortable part of the whole procedure was the rubber thing that I had to wear to keep my mouth open, it rubbed against my gums slightly and I was super happy to get that removed at the end. When I looked in the mirror after it was all finished I was pleasantly surprised by what I saw. The braces and bands were clear and the wires tooth coloured. This meant that the braces were a lot more invisible than I had hoped for. I was thrilled! Janine booked me an appointment for 4 weeks’ time. That night I had made dinner plans for a friends birthday which probably wasn’t the best idea in retrospect. My teeth were sore and I wasn’t used to the “bulk” of them which is my basic explanation for me having to get used to having the braces between my teeth and lips. I was still able to eat and drink, I just made sure that I chewed on the back teeth and used my knife and fork carefully so I didn’t have to bite directly into anything. The next day my teeth felt normal and the ache from the prior evening had gone. 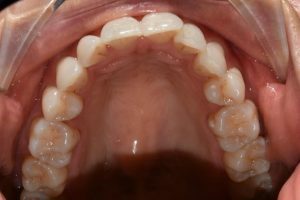 I was experiencing some issues with ulcers inside my mouth where the braces were rubbing. I remembered I had been given a little packet of wax and used this for about 48 hours and the problem resolved. That week was really easy. My family and work colleagues were all really positive about my braces but I felt quite self-conscious and found myself explaining them to people. Most people looked more closely and told me they hadn’t even noticed. My speech was a little impaired for the first few days with S sounds but was otherwise totally fine and by day 4 I was back to being totally normal. I noticed my top tooth that was overlapping the other had definitely moved into more of a straight line and while it did still overlap; I was able to floss more easily between these teeth. So month one was totally uneventful but an absolute success. 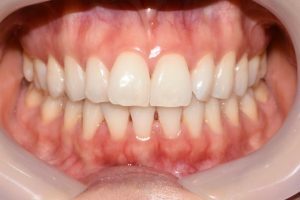 My teeth started straightening up, the pain factor was very minimal and I had no breakages or any other reasons for concern.